Tenerife is one of the most popular Spanish destinations amongst UK holidaymakers, largely because it offers something for everyone! 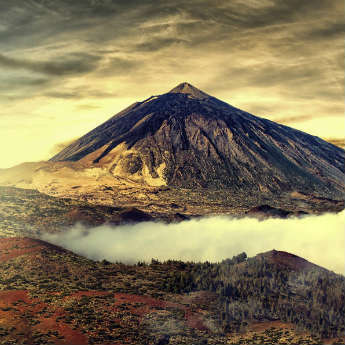 Whether you’re looking for glorious beaches, scenic hiking or great parties Tenerife is the place to find your perfect holiday. Tenerife is home to many spectacular beaches, several of which have been awarded Blue Flag status for their high standards of safety and cleanliness. You could easily visit a different beach every day for a fortnight, or find a favourite spot and settle in for the duration! Due to its large numbers of international visitors Tenerife now has restaurants catering to every taste. Sample the local cuisine at a traditional Spanish restaurant, savour a taste of home in a British pub, or even get your tastebuds tingling with a spicy Indian curry. 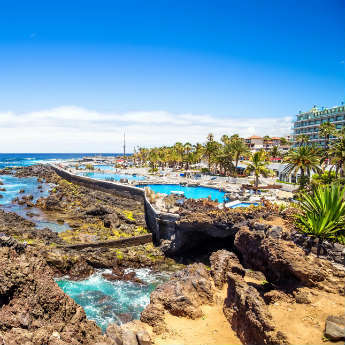 Dubbed the ‘Island of Eternal Spring’, Tenerife boasts year-round warm temperatures peaking at 25°C in June and July, very little rain and plenty of sunshine. With weather like this, it’s always a good time to visit Tenerife! Playa de las Americas is the place to be for party animals; with its wide range of bars and cheap drink deals this resort is always buzzing with revellers looking to dance the night away. Being able to catch up on your sleep on the beach is just a bonus. Tenerife has no shortage of choice for those looking for active pursuits. 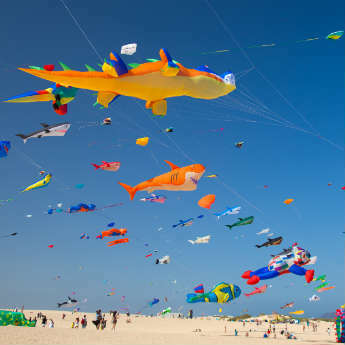 Watersports are particularly popular; go parasailing, rent a jet ski or learn to scuba dive. The island is also home to seven championship golf courses, so hire some clubs and take a swing! Hidden away from the main resorts are medieval towns and quaint fishing villages that are the last relics of the island’s past. Wander through the narrow winding streets, soak up the atmosphere, then visit a museum to discover the island’s vibrant history. Serious hikers will be keen to tackle the 3,700m climb up Mount Teide on foot, but easier access is available via car, bus or cable car. However you get to the top the views from the summit are not to be missed; the volcanic landscapes have a surreal, other-worldly feel. For the kids (and the adults too!) there are several great waterparks where you can have fun in the sun! The largest and most impressive is Siam Park, a Thai-themed park featuring many slides, a wave pool and a Thai floating market. If you venture beyond the bustling beachside resorts, you will find that Tenerife has beautiful scenery waiting to be discovered. The most popular areas include the cliffs of Los Gigantes, the Anaga Mountains and the Masca Valley, and are best appreciated up close on a walking tour. Last but not least, Tenerife is incredibly easy on the bank balance; with most of the resorts being all inclusive you can have the security of knowing all your expenses are already covered, but even if you do indulge in a few nights out or excursions you will find that prices are very reasonable. So what are you waiting for? Book your holiday to Tenerife now!